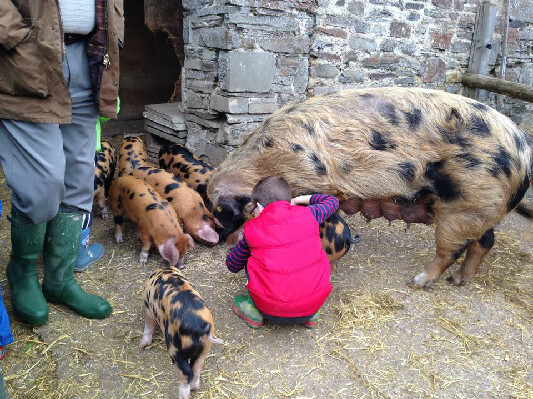 When you stay in a cottage at Lower Hearson Farm you can, if you wish, join us in feeding the animals in the mornings and in the evenings which is especially exciting for the children as they get to interact with the animals and learn lots about them and create lifetime memories. By the end of your holiday they are proper little farmers. 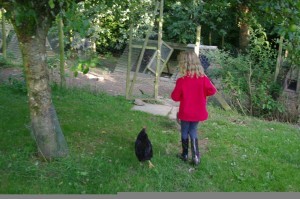 Parents have told us that their children are so excited after having helped us feed and care for the animals during their holiday that when they get back to school they write about it or even do a project on what they have seen and learned. 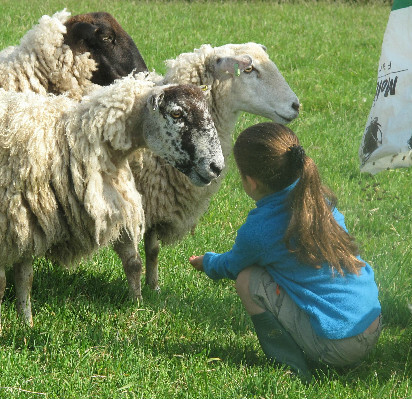 It is always rewarding to see how much the children absorb in helping us feed the animals. By the end of their holiday they know exactly who gets fed, when, how much and a bit about general animal husbandry. 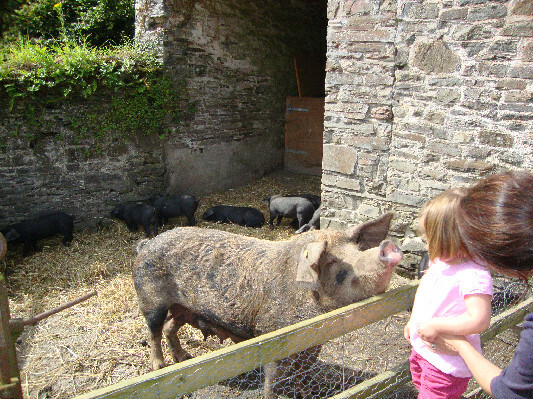 See children feeding the animals by visiting our Facebook page Find out what is happening with the animals on our Newsletter page. We use AI, if possible, because it saves moving the pigs long distances to find a boar which can’t be much fun for them. 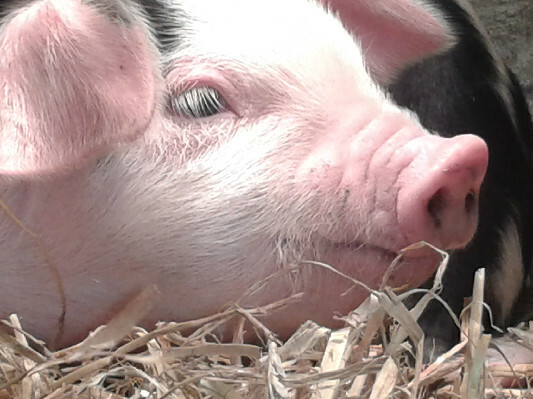 The sows remain in the comfort of their own home and are more relaxed. 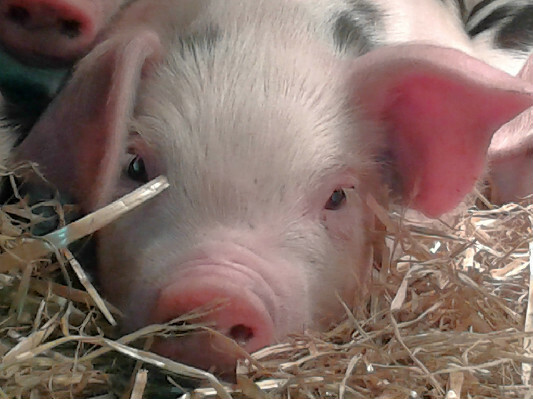 Holly is our very pretty and friendly experienced OSB sow. Holly had her second farrowing this year. Hazel and Ivy will be having their first farrowings next year. Graeme always tries to be on hand to help with the farrowings whatever time of day or night. 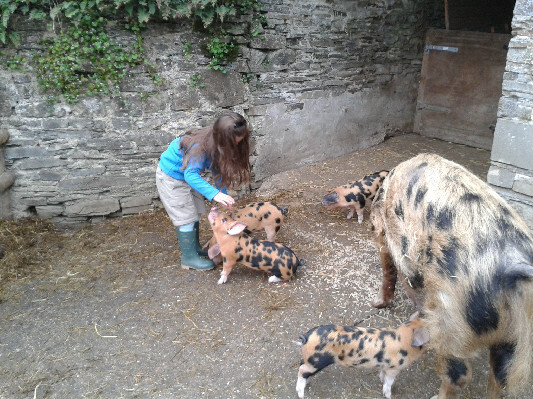 When piglets arrive everyone has hours of fun feeding and watching them along with the chickens and sheep. 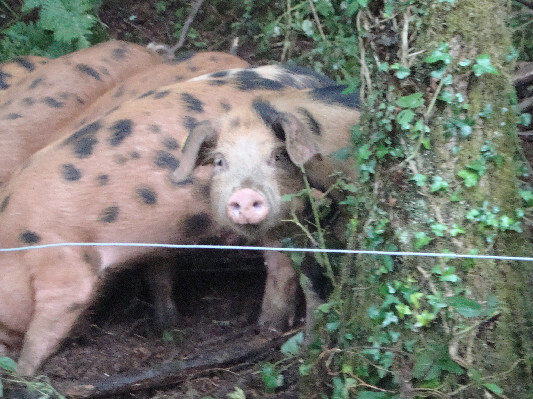 We keep Oxford Sandy and Black Pigs (OSBs) who are very pretty and friendly. 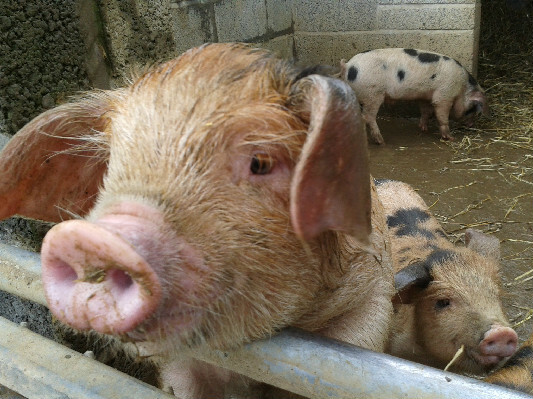 They are a rare breed pig and are sandy or ginger with black blotches. 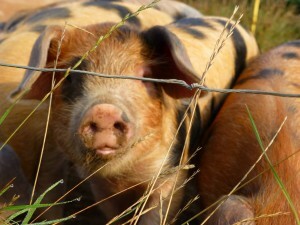 It is believed that the Oxford Sandy and Black pig was first developed 200 hundred years ago in Oxfordshire. 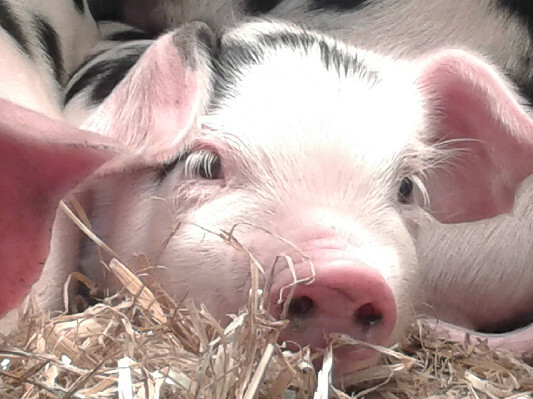 It is a docile, friendly breed with lop ears and is the original cottagers pig. 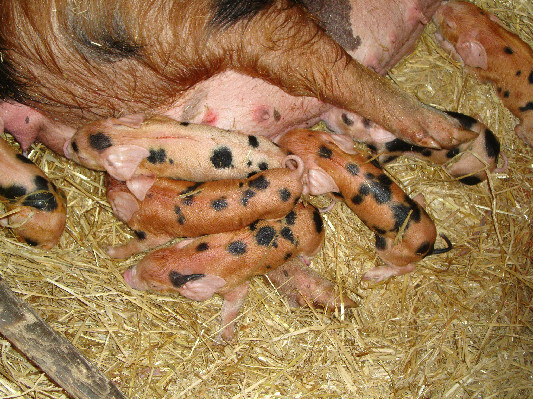 It can also be called the plum pudding pig because of its black blotches. 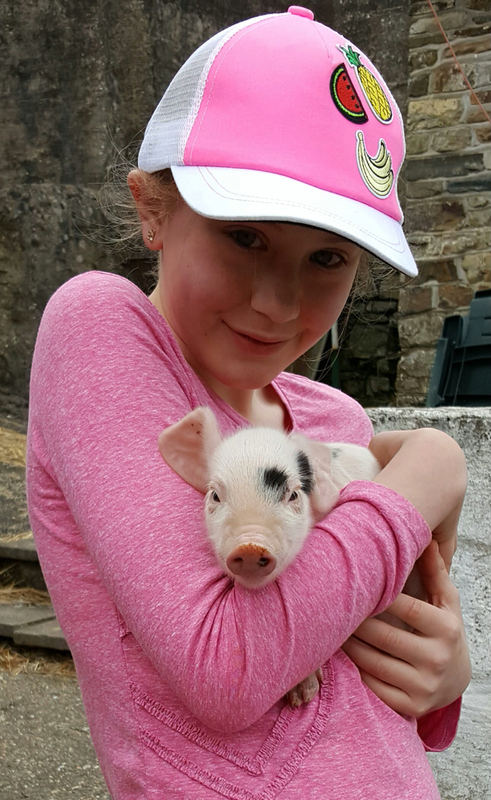 All our pigs have names and they love to be stroked and talked to. 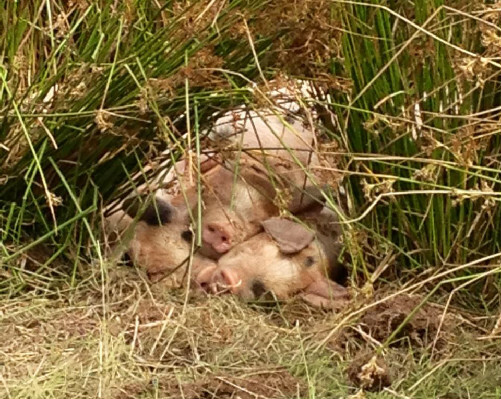 They are fantastic mothers and the baby piglets are fascinating to watch. You can spend ages and ages just watching them play around without realising where the time is going. 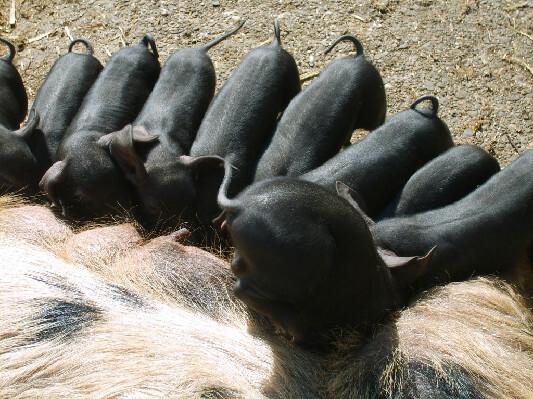 Sometimes the piglets require bottle feeding and this is a wonderful thing to join in with if it happens whilst you are here. 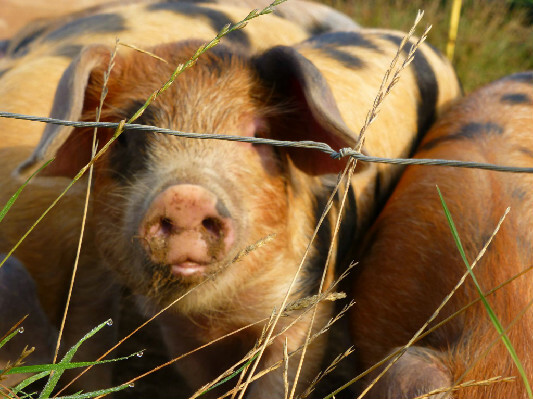 We are members of the British Pig Association and The Oxford Sandy and Black Society. We have a strong commitment to rearing animals in as natural a way as possible. We keep them out in the field in pens so that they can root and dig away to their hearts content. When they farrow we bring the expectant mother down into the barn to keep an eye on her. It is so much easier to walk across the farm yard in the middle of the night to check her than to stumble up the field. 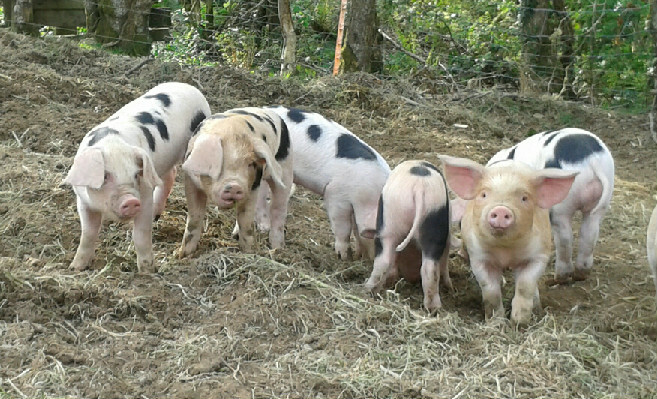 When the piglets are weaned from their mothers they go up to pens in the woods where they have a lovely time foraging for natural food as well as enjoying their twice daily feed from us. If it is really wet in the winter we bring the pigs back onto concrete to make sure that they can be warm, dry and cosy in deep beds of straw. We have two guinea pigs called Fudge and Flash who are incredibly cute. 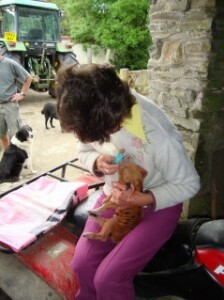 The children can help us feed them and give them a cuddle. 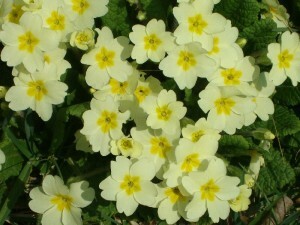 Help to pop them into their outdoor run in the morning and back into bed in the evening. 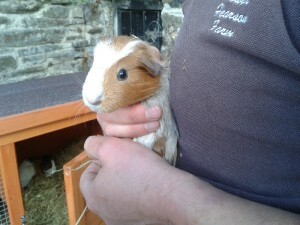 Also join us in a Guinea Pig grooming session twice a week during your holiday. 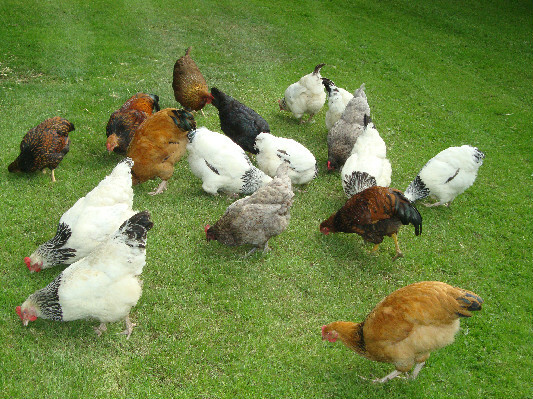 We keep an assortment of rare breed chickens here at the farm. Sometimes they wander around the gardens getting up to all sorts of antics. 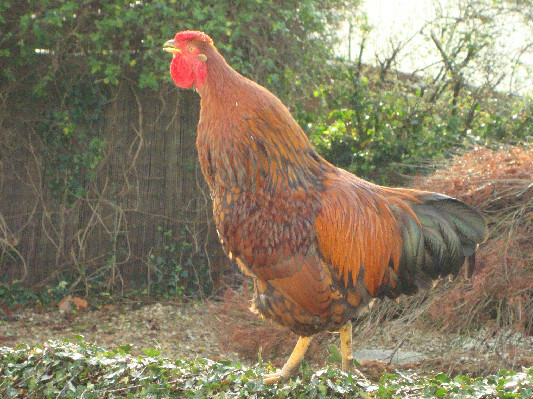 Chickens really do play with each other when they are young and they can really make you laugh as you watch them. 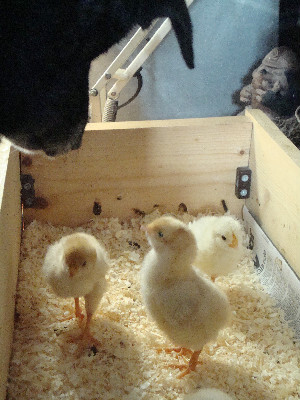 At Easter and during May you can get the chance to see the chicks hatch in the incubator if their timing is right and join us in caring for them first in our kitchen in front of the range where we keep them warm, then in the Roothouse and then finally down with the other chickens. 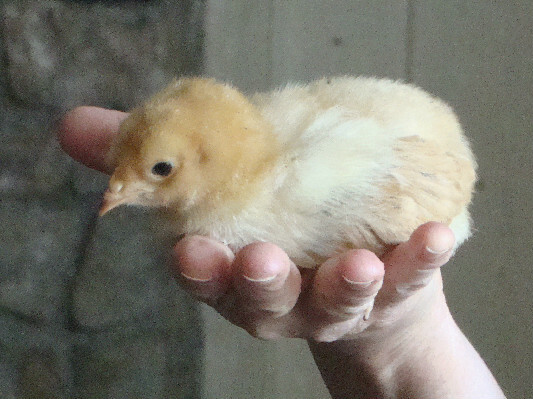 Children love to choose which one is their favourite chick and everyone loves a cuddle during their holiday. 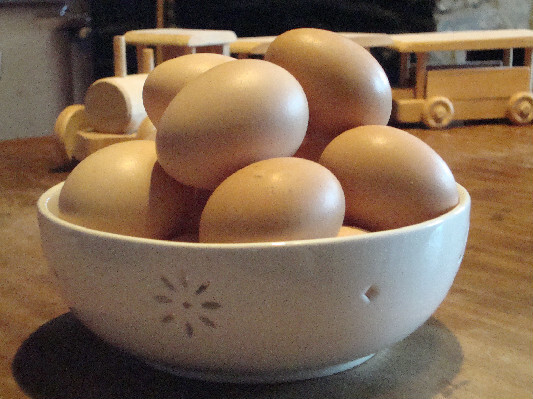 The chickens lay the most delicious eggs which the children help collect at the end of the day. 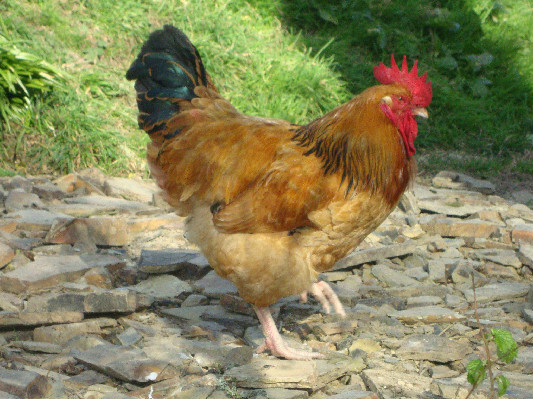 We often have hens “go broody” and disappearing off into the hedgerows leaving us wondering where they have gone only to re-appear a few weeks later proudly showing off their little chicks. 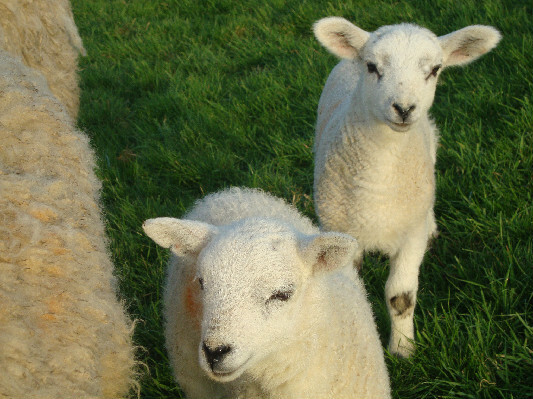 From Easter till late summer we have sheep and lambs in our field that belong to our neighbour. 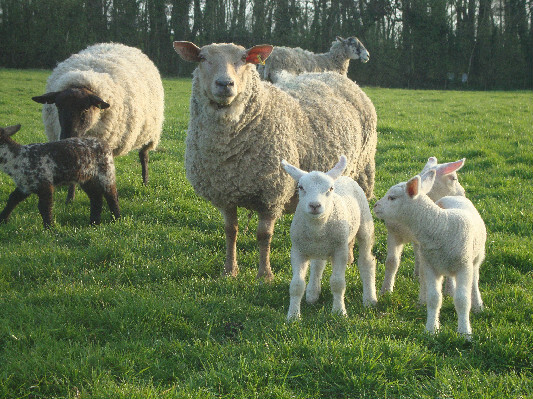 At spring time you can help us feed the mothers with their compound feed to make sure they get sufficient nutrients to keep their milk flowing well for their baby lambs. Sometimes the lambs get separated from their mothers and we have to carry them back to her and make sure she realises that her lamb has come home. 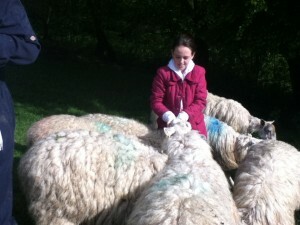 All the sheep and lambs have numbers on their backs so that we know who belongs to who. As the lambs get older it is great fun watching them chasing around in gangs playing.